New Scotland coach Vern Cotter kicked off his tenure with a 6-24 Test victory over the United States in a warm up for next year’s Rugby World Cup. Scotland and the USA will meet again in 2015 at the Rugby World Cup and Scotland will take a psychological advantage into the match after their away win. “That was tough, we’re not used to playing in heat like this,” said Scotland captain Greig Laidlaw, but if the tough conditions offered any opportunity to the Americans on Saturday they were unable to take advantage. The hosts’ early aggression yielded more penalties than chances, and the Scots held them without a try. “I thought we showed good structure in the first part of the first half and gave ourselves the opportunity to score a couple of tries,” said Cotter, who has been tasked with guiding Scotland through next year’s World Cup. “Our scrum got the better of their scrum which enabled us to get a grip of the game and also gave us points as well, so that was pleasing. Tim Visser and Stuart Hogg scored tries either side of half-time as Scotland made a solid start to a tour that will also include clashes with Canada, Argentina and South Africa this month. Having lost their last two Six Nations fixtures to France and Wales in March, Scotland bounced back versus the Americans with Laidlaw opening the scoring in the sixth minute with a penalty goal. The United States struck back through Chris Wyles’s penalty, but Scotland seized control in the 14th when Laidlaw set up Visser for a try. 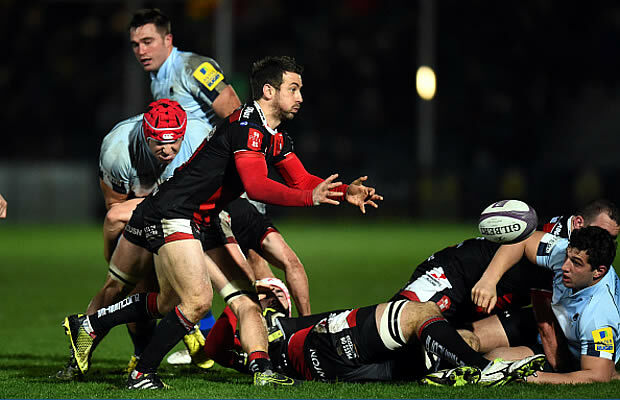 Laidlaw added the conversion and Scotland led 10-3, while a penalty try in the 31st minute and another kick from the Gloucester scrum-half gave the visitors a 14-point lead at the break. The United States scored first in the second half with another Wyles penalty goal, but Hogg scored Scotland’s third try in the 66th minute with a driving run, before Laidlaw’s third goal stretched their lead to 24-6. US coach Mike Tolkin was frustrated by his team’s struggles. “The first half of the game we were too aggressive where we shouldn’t have been and got stupid penalties early on. Next Story → Former Bok captain tests positive for drugs. Again.